What&#8217;s going to click in 2009? What’s going to click in 2009? Low-cost, practical tributes to the zeitgeist. It is about the power of making products and services relevant by incorporating “attributes" and features that cater to distinct (if not niche) consumer lifestyles and situations (Nichetributes is decidedly not about advertising, i.e., tailoring a mass product’s message to a specific audience; it’s about tailoring the product itself to that specific audience). This is not about Nouveau Niche or the Long Tail: Nichetributes are attributes/features/additions to existing products, which make them more practical for specific user groups, while at the same time signalling to those users that the brand “gets it", that it cares, and in some cases even pays tribute to their lifestyle. • Anything prefaced by “i" continues to be fair game for Nichetributes: Dots Gloves are knit gloves with metal dots on the fingertips that won’t scratch iPhones, iPods or other touch screen phones or devices, while Etre Touchy gloves keep hands warm and dry while operating electronic gadgets by baring only the wearer’s index finger and thumb. 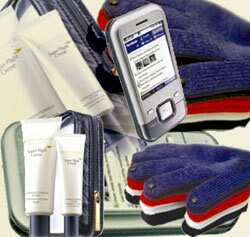 And how about the first hands-free cellphone glove for winter sports, the GX-1, by Swany? • The INQ1 is the world’s first social networking mobile phone and will be launched on the 3 network in the UK. Online services such as Facebook, Windows Live Messenger, Skype and Last.fm are integrated into the phone’s operating system, allowing a user to—for example—access Facebook contacts from the phone’s address book and to see friends’ profile pictures when they call. Cool stuff: The INQ1, the world’s first social networking cellphone, Esteé Lauder’s Super Flight Creme and the cool Dot Gloves are specially designed for touch screen gadgets; (above) Feedback 3.0 will help start direct conversations between firms and consumers, though it may be too late for some. • For consumers, anything practical and useful will go down well in more austere times, while anything that speaks their language (and thus ultimately shows that a brand cares about its customers’ interests) will be reciprocated with appreciation and goodwill. Which in today’s harsh business climate is like, well, gold dust. • For businesses, Nichetributes can often be imagined and introduced at very low costs (which doesn’t hurt when budgets are tight); the only resources needed are creativity and a good feel for the consumer trends that matter most over the next 12 months. • Most important of all, ultimately this is not about gimmicky fingerless gloves, it’s about integrating the “now" into your 2009 activities, achieving relevance for, and goodwill, from your customers, in an environment that has never been more about the “now" than, well, now. In 2009, you define what constitutes luxury. How will luxury brands fare in 2009? What will define luxury over the next few years? The answer to a large degree is, “luxury will be whatever you want it to be". On to every brand professional’s favourite topic (or so it seems at times): the future of luxury. After all, what constitutes luxury is closely related to what constitutes scarcity. And while scarcity in traditional consumer societies was for decades defined by the biggest, the best and the most expensive “items", the consumer arena in 2009 shows a bewildering number of “scarcities", some of them invented purely to overcome the abundance now found in traditional sectors. More than ever, scarcity is in the eye of the beholder, especially those beholders who are desperately trying to be unique. So in 2009, instead of worrying about missing out on the next big thing in luxury, focus on defining it. Declare that the end is nigh for anything that’s getting a little too affordable, too accessible, or just too well-known. Then introduce something very different (if not the opposite), appealing to the in-crowds ready to jump ship anyway. • Named after the “rough luxury" trend that was coined by the hotel’s owner, Rabih Age, Rough Luxe is a new London hotel with small, funky rooms, some of which share a bathroom, while also offering fine wines, plush bedlinen, carefully curated art, and top-notch personal service. From their site: “Rough Luxe is a new way of looking at luxury as part of time and not only part of an object of consumption. Luxury is an enriching personal experience and not only an ownership or consumption of an expensive object. Therefore, the Rough Luxe definition of luxury is: time for reflection, personal encounters with people, nature, architecture and environment as well as food and social and cultural experiences linked to geographic locations." • Along the same lines, though a bit more “Deluxe Bohemian" than “Rough", is the soon-to-be-opened Ace Hotel New York. Its “resourceful rehab" approach will include (reupholstered) furniture from salvage shops and flea markets. Want something to play with? How about Discreet Chic? Recession Chic? Frugality Chic? Understand Chic? Or anything that’s commissioned? Access? Secrets? Stories? Time with one’s loved ones? Time for oneself? All things local? Peace and quiet, if not escape? Eco-friendly? Human-friendly? Caring? Empathy? Craft? Friends? Having a larger-than-life perspective? Households of six or more? Eccentricity? Appointment-only? Opinionated? Premiumization? Philanthropy? Knowledge? Skills? Health? Etiquette? Or a mix of any of these? Whatever angle you may go for, luxury in 2009 will comprise much, much more than ostentatiously flaunting wealth (which, by the way, will still enjoy considerable popularity among emerging middle classes around the world). Find the right (status) trigger for the right audience, then coin it and build on it. • Feedback 1.0 (one of those early Web phenomena) saw outraged individuals posting scathing reviews, feedback and complaints, often to the delight of other netizens. Brands remained unaware or chose not to listen, dismissing these outbursts the way they’d dismissed any kind of customer dissatisfaction for decades. • Feedback 2.0 (which we’re in right now) is about these rants—and some raves—having gone “mass" (no, make that MASS!). The long-predicted conversation is finally taking place, albeit among consumers and not, as intended, between corporations and consumers. Companies have started taking note, but to a large degree still choose to listen, not talk back, trying to “learn" from the for-all-to-see review revolution. Which is surprising, to say the least, since a quick and honest reply or solution can defuse even the most damaging complaint. • Feedback 3.0 (which is building as we speak) will be all about companies joining the conversation, if only to get their side of the story in front of the mass audience that now scans reviews. Expect smart companies to be increasingly able (and to increasingly demand) to post their apologies and solutions, preferably directly alongside reviews from unhappy customers. Expect the same for candid rebuttals by companies that feel (and can prove) that a particular review is unfair or inaccurate, and want to share their side of the story. • Tripadvisor’s management response feature allows representatives of hotels, restaurants and attractions to respond to reviews written about their properties. Local business review site Yelp.com allows business owners to manage their own page with detailed information, and lets them respond privately to reviewers. The latter is also offered by product ratings and reviews provider Bazaarvoice.com, which allows owners direct contact with posters of negative reviews. HomeAway.com, the vacation rentals marketplace, has an owner-response feature that allows property owners to post publicly in response to reviews. • There’s also a self-organized “right of reply": We’ve argued (for years, really) that setting up one’s own conversation website for customers is the most amazing way to prevent damning reviews from popping up all over. It’s been happening for quite a while on sites such as Dell Ideastorm and My Starbucks Idea, where anyone can post suggestions, with Dell and Starbucks actually replying for all to see. Starbucks also Twitters about the latest happenings on My Starbucks Idea. Two conversation-expert firms that can get you started with this kind of Feedback 3.0 are Feedback 2.0 and Salesforce Ideas, which powers Dell and Starbucks. • Also, check out GM Facts and Fiction, a theoretically interesting approach by GM to tackling the many “myths" about the company and its current problems. Pity they don’t allow for any kind of real conversation… Last time we checked, the comments feature was turned off. • Consumer reviews—given the importance of “right of reply", we’ll soon see more companies keeping a close track of incidents, complaints and other less-than-great customer interactions, gathering evidence to defy unfair complaints or half-truths. And just like customers, management will increasingly resort to visual/audio “proof": candid, on-the-spot photos, videos and recordings. Remember, though, as a brand there’s one thing that beats an active Feedback 3.0 strategy, and that’s preventing complaints! How? By performing better, of course. And if complaints arise, go out of your way to solve the issue(s) on the spot. Each time you do, there will be one less negative review to deal with. • Consumer suggestions—in 2009, many more big brands will jump on the “open conversation" bandwagon, asking for user suggestions and ideas in the process. Sadly, many of these brands will only do so because of their own deteriorating prospects; suddenly they’ll be willing to listen to their customers, begging them for ideas to avoid bankruptcy. • Needless to say, those pleas will fall on the deaf ears of indifferent customers who have been neglected all too long. In fact, the reason so many companies are struggling is precisely because they’ve never had these conversations. For the other three consumer trends in 2009, read next Wednesday’s Mint.